First, the easy part. I have a new post up over at Tungsten Hippo with my top five reasons for reading short eBooks. It is, appropriately, quite short, so you can go check it out and be back here before anyone notices you're gone. Hint, hint. I had written the majority of that post earlier this week, and it is a good thing, because our weekend, which was already verging on overpacked, took an unexpected turn yesterday when Petunia broke her arm. Except we didn't know right away that she broke her arm, so we let the poor girl sit around with a broken arm for a couple of hours before I took her to the doctor. We were at a birthday party when it happened. It was a party for one of Pumpkin's friends from school, but Petunia had been having a great time. It was a costume party, so she got to dress up (she decided to wear last year's Halloween costume, which was a zebra). There was a pony giving rides, and another pony pulling a carriage ("like Cinderella!" Petunia said). An ice cream truck came by and I caved and bought her a fudge bar. There was a little house she could play in, and an old Radio Flyer rocking horse that she adored. And there was a jumpy. At first, there were too many big kids in the jumpy for her to go in, but she waited until she big kids got distracted by a costume competition, and then she got in and jumped and jumped and jumped.Then the big kids started coming back, and it was getting a little to rough in there for her, so she got out. She was sitting on the inflated step into the jumpy, waiting while I picked up her shoes to put on her, when one of those big kids also decided to get out. He came out enthusiastically, in a head first dive, and he created a catapult-type effect on the inflated stair. Petunia bounced up and off the stair. I dropped her shoes and managed to keep get close enough to keep her from hitting the ground head first, but she fell hard and awkwardly on her right arm. She cried and cried and cried. I don't think I've ever seen her cry so long. She eventually snuggled into me, and let me hold her until she stopped crying, and then she fell asleep. She woke up about fifteen minutes later, but I held her for the rest of the party. She perked up a little when it was time for cake, but she barely ate any of her cupcake. We left as soon as Pumpkin was done with her cake. Once we got home, I was able to take Petunia's shirt off and inspect her arm, and I couldn't really tell if anything was wrong. It was maybe a little swollen, but not a lot. She could move her fingers and stretch out her arm. She let us touch her arm without complaint, but she said her arm still hurt. I was worried, so I called the nurse line. They couldn't rule out a break, so I took her to urgent care, expecting to get an x-ray and confirm that she was fine. The x-rays, however, came back showing a buckle fracture in her forearm. We'll get the final read on the x-rays from the radiologist tomorrow or Tuesday (no one knew if the radiologists would be working on Veteran's Day), and assuming that confirms the break, we'll get a referral to pediatric orthopedics for a cast to replace the splint they put on in urgent care. Petunia has adjusted remarkably well to having the cast on, and was running around and playing happily today. Mr. Snarky and I are trying to figure out what to do about her activities. 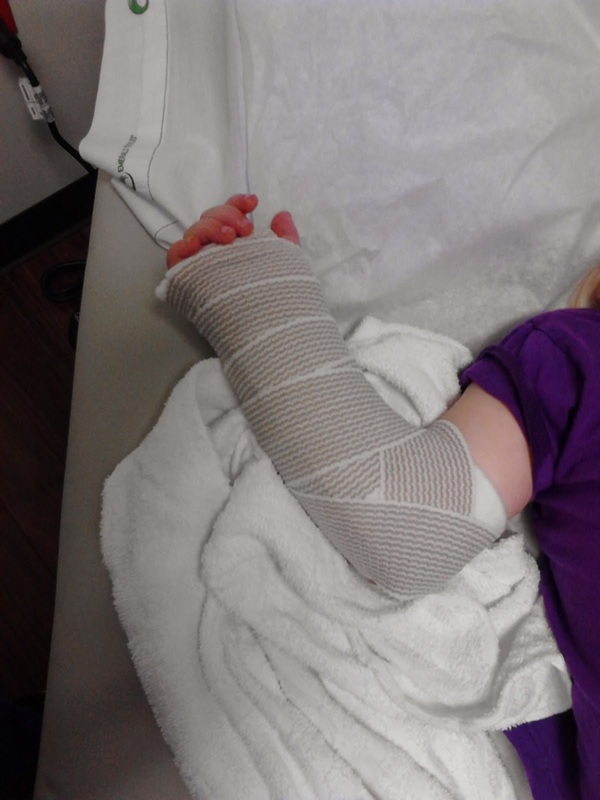 Obviously, she cannot go to swim lessons or gymnastics for the next 6-8 weeks. We suspect soccer (which just started on Friday) will be out, too. We're not sure if we'll need to pay for her spot in those lessons anyway, to keep it open for her return. We're not sure if we will pay if the various organizations tell us we need to do so, or if we'll just stop paying and take our chances on there being a spot for her in six weeks. We'll have to sort that all out this week, in addition to getting Petunia to at least one doctor's appointment. To make matters more complicated, Mr. Snarky leaves on a business trip on Saturday morning, so even though Petunia won't be doing gymnastics or swim lessons, she'll have to come along to them. I'm not sure how that will go. And if there are follow up doctor's appointments, I'll have to be the one who handles them for that week, even though this is a very busy time of year for me, and that is compounded by the fact that my company is moving at the beginning of December. In short, I'm feeling a bit logistically overwhelmed, and have basically stopped making decisions. I need to snap myself out of that ASAP, though- Pumpkin has a cheer event at a college football game on Saturday, and I need to figure out the plan for going to that. My sister has volunteered to come along to help me entertain Petunia while watching the game and waiting for Pumpkin's big moment on the field. Mr. Snarky is quite sad he'll miss this event, since he has yet to go see a football game, and was looking forward to it. I am not at all a football fan, and never was, not even before the current controversies over concussions and players being assholes, so I am less excited about the "opportunity" to watch a game. But Pumpkin is excited enough about the chance to perform a cheer in public to cover the excitement quotient for the entire family, so we'll go and it will no doubt be fun. Anyway, Petunia breaking her arm just feels like one more thing in a string of things that have been piling on and making me figure out a plan, and I find myself all planned out. I'm not sure what the remedy is for that. I don't really feel justified in asking the universe to cut me a break already, because frankly, I am well aware of the fact that it really, truly has cut me a break. Looking on a global scale and/or a historical scale, I am leading an unbelievably lucky life. This is particularly obvious right now, when the news is full of coverage of Typhoon Haiyan/Yolanda. Mr. Snarky likes Marc Cohn, and at one point, the CD got left in the car long enough for this song- or really the refrain- to worm its way into my brain. I don't think the song is actually all that appropriate for the feeling I get of needing to just take a deep breath, grow up, and get on with it- but that refrain is. So I'm off to get some sleep. Tomorrow, I'll get up and dig down a little deeper. I'm so sorry to hear about Petunia's arm! Not fun at all, especially with dad away. My son has broken his arm twice in the past 6 months, and one thing's for sure, he has taken it better than his parents, at least after the initial pain. One small thing that might help is if you splurge on a waterproof cast. They are more expensive, and not every place does them, but it makes bathing so much easier, and she could probably even continue swimming- my son did. And nice to be able to clean the skin in there. For my son, missing out on activities his brother was doing, particularly if he had to watch, was the hardest part. Also, when they say to go easy for 6 weeks after the cast comes off, you might want to extend that to 7 or 8 weeks! Good luck in the next few weeks. Casts are so exciting--maybe petunia will enjoy carrying a marker around for her teachers to sign with. I'm so sorry! It always seems to come all at once. I'm glad Petunia isn't hurting too much now at least. I remember the crying and crying being the sign that my sister had broken her collarbone, although we also waited several hours before going to the doctor. It's so hard to tell! I was playing chutes and ladders with my daughter the other day and actually getting a little frustrated that you would make progress only to have to go back down a chute and that there were more chutes as you got closer to the end. (Yes, I apparently have less patience with this game than a 5 year old) Then I realized that this game is like life. You think things are going along OK or you get a big climb up a ladder and then back down you go. That switch between OK or getting better to suddenly overwhelmed is one that I just haven't adapted to yet. Also, I'm not good about asking for help when it inevitably happens. I'm also typically trying to bring both kids along for every activity even when only one does it. So, I guess what I'm saying is be kind to yourself and ask for help while your husband is out of town. Get a fun babysitter for Petunia when you have to take Pumpkin to her activities, or ask a friend to take her to the activity if she has friends who go. Get take-out food. Let them go to the child care at the gym and get in a little exercise (and a shower!). Now I don't take my own advice, but I'm realizing that when I'm pushing myself to the limit, I don't have the energy to be the (at least somewhat patient) person, employee or parent that I want to be. This sounds like a lot to handle as a single parent for a week. Wishing you good luck and am glad you have some family close by to help. Hope Petunia's arm heals quickly. I also second the waterproof cast, sounds like it would make life easier. Do the hosts of the birthday party know that a child broke her arm at their house? Do the parents of the little boy who caused her injury know about it, too? I say that because if it happened on my property, or if it were one of my kids who caused that degree of physical harm to another child, I would want you to tell me about it so we could address it. Then I would give you my homeowner's insurance info, and/or I would have my son pay Petunia a visit to check on her and apologize. Poor Petunia! I second what others have said. You have resources and this is a time to use them. Get a sitter to trade off with you on taking Pumpkin to things vs. staying with Petunia. Each kid gets some quality time with mom and you don't have a sad 4-year-old constantly having to watch her sister do stuff she can't do with the cast. Re: cheer. I would be mystified if Baguette loved it, but I think there's a world of difference between encouraging your children to try things and explore activities that they enjoy--no matter how you feel about them--and encouraging them to fit a persona. As long as she's having a blast, and cheer isn't the only thing in her life (and I can't imagine it is), then Go, Pumpkin! Baguette broke her leg a little over a year ago. We didn't see what happened, because she had gone into the other room to "play with the telephone," but as best we can guess, she then climbed on the bed and came off of it wrong. It took us, two doctors, two sets of x-rays, and two and a half days to diagnose the break. And she hate-hate-hated the cast, but fortunately it was only on for two weeks. I hope Petunia has a speedy recovery! So sorry to hear about Petunia's arm! Just wanted to chime in with everyone else--lean on other people, don't hesitate to ask for help while the mister is gone. Breathe. You'll get through it. Thanks for the nice comments, everyone. I'll answer all in one comment, because... just because! My parents have offered to drive over and help out. Whether to take them up on that is one of the decisions I need to make! There are complicating factors I'd rather not go into, but yes- I can get help here if I decide I need it. However... Petunia wanted to go to swim lesson with Pumpkin today and she wants to go to gymnastics on Saturday. I think this is because she wants to show her teachers her arm. I'm waiting for Mr. Snarky to be done with Petunia's bedtime to get the full story on how swim class went. Anyway, they said that they've never had a kid do class with a cast on, but they've had teachers teach class with the waterproof casts, so I think I'll ask the doctor about that. Also, they can probably hold her spot for ~6 weeks, so we should be OK regardless. Petunia is super excited to get a cast. She's heard she gets to pick the color, and wants rainbow. I fear she may be disappointed... but I think she'll be OK with whatever she gets, because lots of people want to help her decorate it. We'll see the parents whose hosted the party picking up or dropping off at our before/after care at school. I figure I'll only ask about her homeowner's insurance when my medical insurance asks us to- that makes it not so awkward. And I don't really blame the hosts. They had the jumpy set up safely. The kid who bounced Petunia off the step, though... well, yes, he behaved poorly. But I did not really see who it was. It wasn't someone I know, and he was gone before I finished gathering Petunia up. I'm sure his parents have no idea what happened. I'm not even sure HE noticed what happened! So yeah, no teachable moment for him. "My parents have offered to drive over and help out. Whether to take them up on that is one of the decisions I need to make!" Glad that Petunia is taking the cast well! My middle boy's friend E had his leg broken by a kid who on purpose jumped on top of E from a high slide as E was passing by. E was in a cast and out of school for months, nothing happened to the jumper. These things make me livid. Well, my insurance company would not be having that, if nothing else. My little one fell at school (he was only 18 months old) and cut his lip on the edge of the table. 2 stitches. Then the insurance company sent us a stream of paperwork to fill out for the 'accident', in order to make sure some other kid wasn't responsible. If James had been pushed, for example, the insurance company would have gone after the kid's family/insurance. Poor Petunia! I'm glad to hear she's cheerful about it. It's like how they can be throwing up one minute and running around giggling the next. Kids are weird, and wonderful, that way. Oh I'm sorry! In contrast with the others, at least for the kid who jumped out, I have to admit I think of this mostly as "just one of those things." His behavior doesn't sound (based on your description) as egregious, just careless/enthusiastic (childlike), and ... this seems like one of those things. Not that that helps! I do feel for Petunia and for you. Also, my (generally cautious and always caring) mother let my brother go for several days with a broken arm (he and a friend had been climbing up opposite ends of a rope thrown over a tree branch when the friend let go of his end. Physics, anyone? Certainly childlike in that case. ), in fairness, among other things, this was after hauling me to the orthopedist several times for a NOT broken arm. So, you know, it's hard to know -- one of those things. Add me to those voting for accepting available help early and often. I don't think the boy who bounced her off the step should be punished, but I do wish someone other than me had seen it and could have pointed out to him what his actions did. I was obviously too busy attending to Petunia. It wasn't that he was behaving maliciously, but he was behaving carelessly, and not paying attention to the impact of his actions on others. How will kids learn that they need to pay attention if we don't call them on it when they don't and their actions have profound consequences on someone else? Oh, poor Petunia and poor you. Good luck getting through the next couple of weeks. Survival mode is what we do around here when that overwhelmed feeling strikes - frozen Trader Joe's stuff for food, decline all "extra" invites/appointments, and I go to bed soon after the girls. Hugs to you and sorry we're not closer to help. Note to @shademar in your twitter feed--dh's industry job offer in stem literally 2x his last tt academic salary. We're wondering why he didn't quit earlier.